"Would you mind if Mimaki could corporate with my creation ?" It was last summer (2016) when Ms. Yumie Shirai visited Mimaki for the first time. 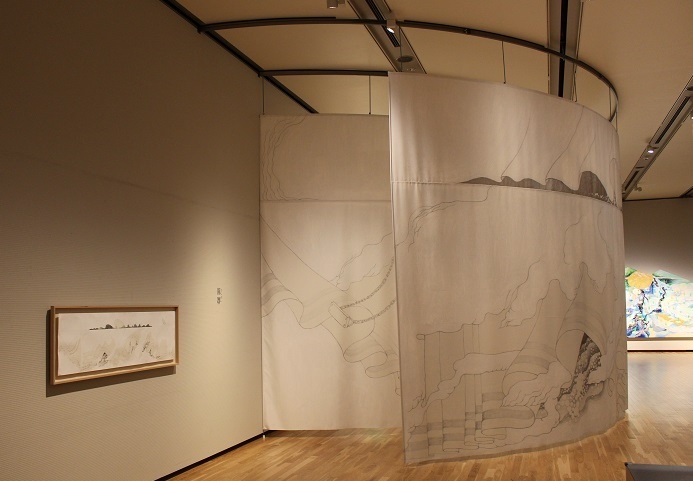 She wished to print her artwork on a huge hanging curtain which would look to surround her arts at an exhibition. And she said she would not like to be works already created, but rather, to draw a work that would match the characteristics of Mimaki's printer and printable material. Then we proposed sublimation transfer printing using our inkjet printer "TS500P-3200" boasting the largest print width of 3.2 meter. As Ms. Shirai was feeling the characteristics of our printer through her sample creation, we printed the art drawn by Ms. Shirai on the fabric (polyester). "Ueda Zen Tenkiko (All weather & climate of Ueda)", the first large-scale private exhibition by Yumi Shirai, an artist who continues her creation in Ueda city, next to Tomi where Mimaki is headquartered. 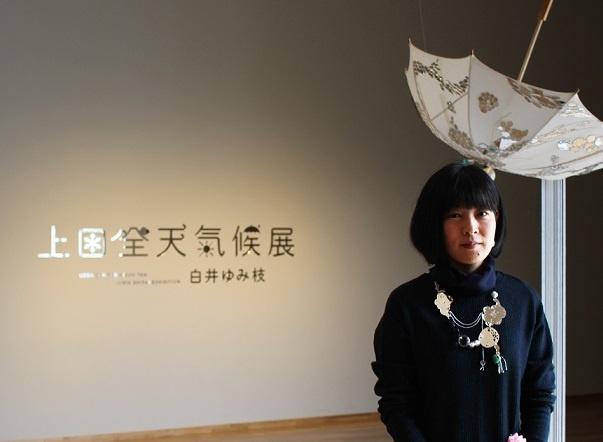 There are exhibited together approximately 50 items including drawings that she superposed her hometown of Ueda weather / climate and each image of east, west, north and south to match their image. 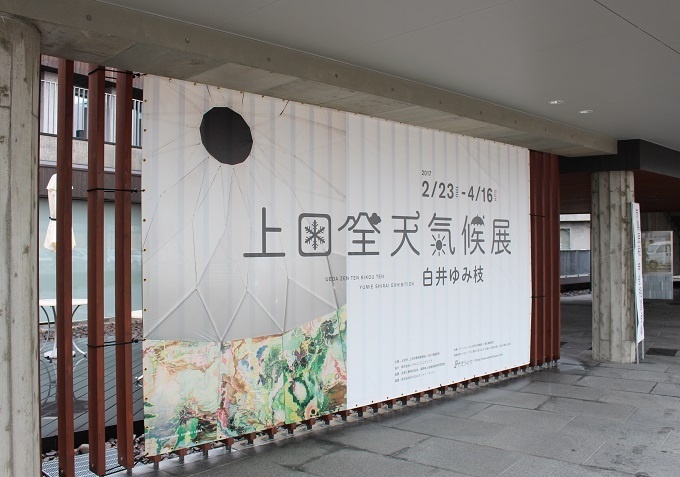 "Oto-maku (Windscreen)" which we printed this time was exhibited in the area imaged as "North". 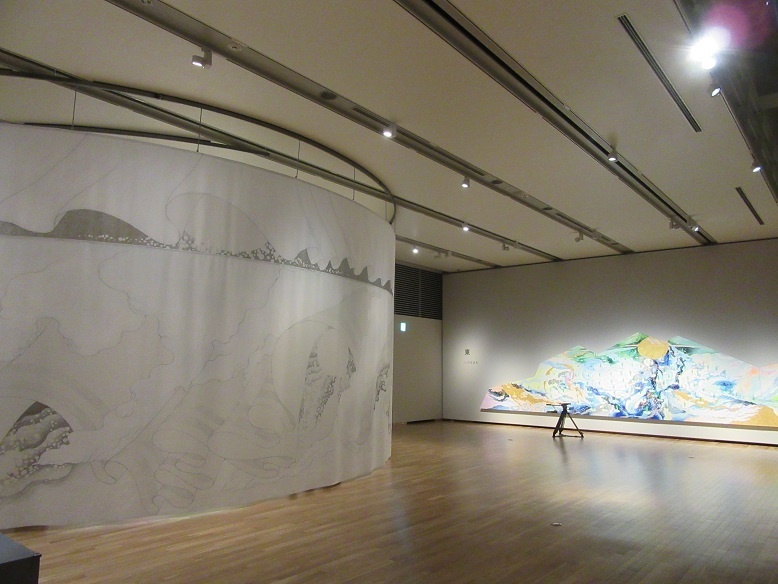 It was hung from the ceiling so as to surround the oil painting "Tamashii Fuyuru (2015)" painted with an image that overlaps Polaris with the center of the body. It turned to a great silent presnece as a partition off the venue and one of her works as well. 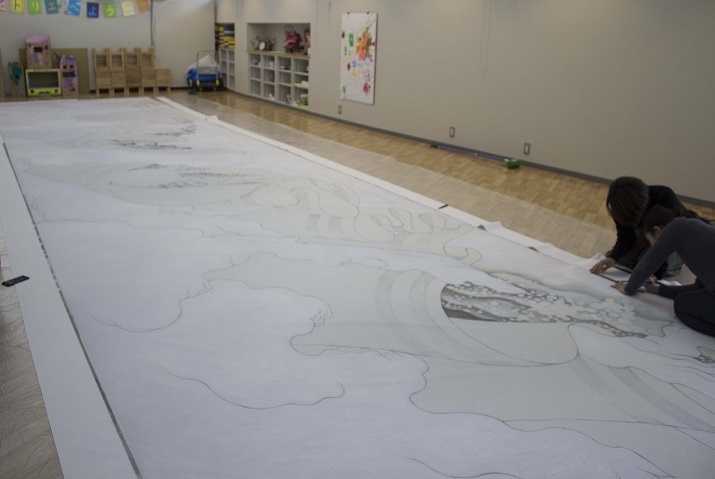 Printing art works on a huge curtain ! 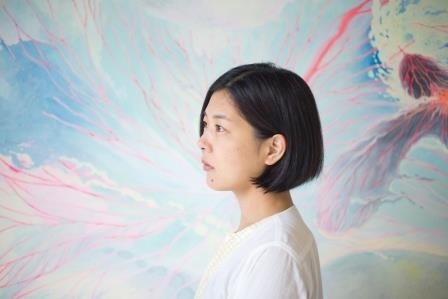 "I had the opportunity to see Mimaki's prints in various places and had an image that it was also printing a large size so I have thought that I wish I could make it together since receiving the offer of exhibition's plan. If I do it at all, I wanted to collaborate properly rather than just scanning the works I have done to print. Since the image of the work wraps the one of "North", I thought vaguely that I wanted to express Taro Mountain and Sakasa Giri (Inverted mist) (*1) in the north of Ueda. I did not know how much magnification it is necessary to draw, but the drawing depends on the size also changes. It was interesting that I was able to draw while discussing one by one, for example, an appearance of black color and pencil lines, etc." *1: A mountain familiar to people of Ueda city so that it is called the mountain of the Ueda citizen. In addition, the "inverted mist" is the cloud that clouds over the mountain ranges of Taro Mountain and it flows down like a waterfall. Presence of unconscious noise in the high quality print, which matched with my image of "Oto-maku (Windscreen)". "The original work is painted with pencil and acrylic. It was not painted with a big brush roughly, but it was coated in detailed and sticky touch with a rather thin brush. If we print large ones into small size, the density gets higher and the finish is better, but this time it is completely opposite. As I print by larger size a work drawn of 1/10 size, I wondered if the line would be rougher than I imagined ... so, there was also uneasiness. However, when I looked at what I actually printed, I could see the texture painted with white paint and its unevenness, the paper feeling, etc. Then I felt the nature of this art work there. " By high-quality print, the art work appeared with detailed brush strokes and texture. 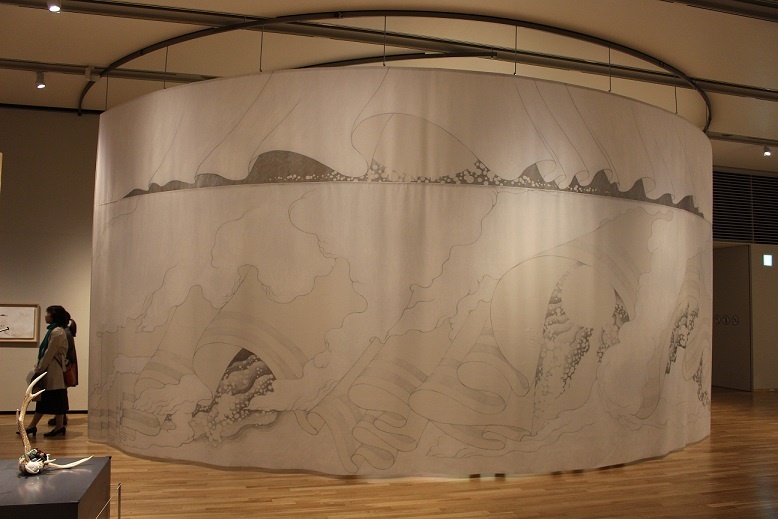 The large art work sized 4 m x 12.9 m. Fabric cutting and sewing required an extensive job to occupy a whole room. "While drawing a picture, I began to think that the image like the wind was blowing, and drawn a picture that the curtains are further blown in curtains. But if it is named "Kazemaku" (Windscreen) it does not fit at all. In those days, long ago, the wind was caught as a sound, I learned that letter "wind" was being read as sound. When I look at the curtain that I printed on, I enlarged and printed the art work I painted in detail, not only the lines and texture that I would normally not see, but also pencil shavings and fine garbage appeared as it sounds like "noise". It fitted to my inspiration to realize my image to be. As it is a high-quality print, it is fun to say that it existed as a work, faithfully appearing to unconscious things that you cannot see normally though. I got a fresh surprise beyond my imagination, sure ! " As a partition inside the hall, as one art work, it is "controlled presence" to harmonize with the venue. "Oil painting works have the same powerfulness that I drew, but the texture of the print is the opposite. It seems that only the image is transmitted. The main character of this time is surely oil painting. This curtain is not the main of the venue, but it is important. When I paint the curtains by hand, I get a feeling of oppression, so I wondered if the "controlled presence" of print was unique and awesome. I think that it was made up in a work adapted to the balance of the venue. Please try to appreciate my work from various angles. " 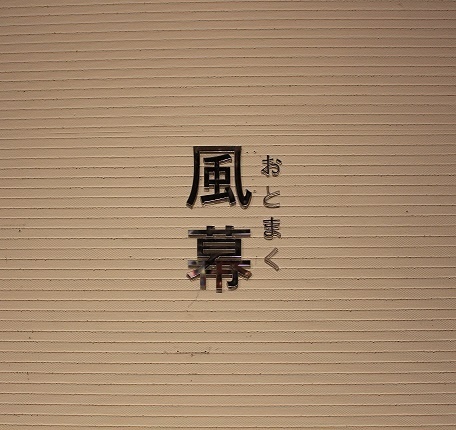 Born in Sanada-cho, Ueda city. 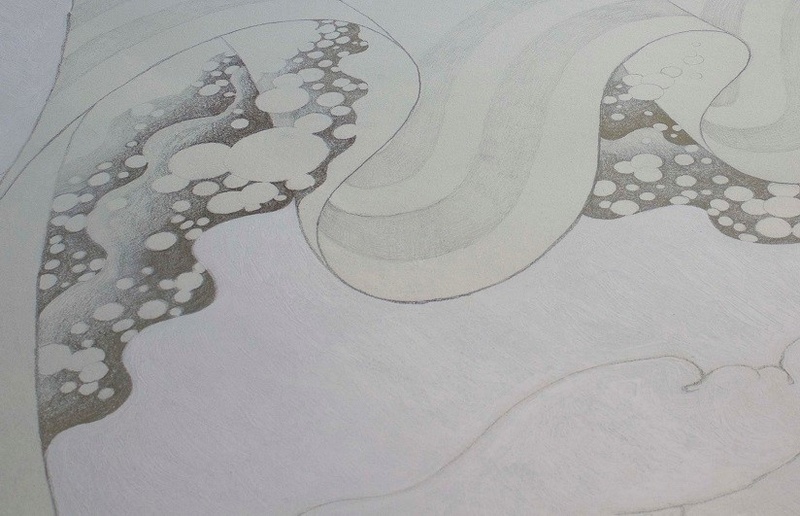 Besides activities of private exhibitions and group exhibitions, she also handles bindings and illustrations. From 2010, the poet, Kumiko Takahashi (ex-member of Chatmonchy, Rock band) and "Hitono Yume" exhibition in Tokyo, Tokushima, Ehime. In 2013 "Hitono Yume in Nagano" was held in Ueda City. Workshops with children and students, planning and producing walking maps of towns, etc. She also works with people living in the community. A 3.2 m wide super wide sublimation transfer ink jet printer with beautiful print and stability to make good use of high production. Taking an advantage of its wide print width, a wide range of prints from sign application to interior fabric production is possible.